"This classic cheesecake topped with cherries is a special occasion indulgence that will serve a crowd." Preheat oven to 325 degrees F if using a silver 9-inch springform pan (or to 300 degrees F if using a dark nonstick 9-inch springform pan). Mix crumbs, 3 Tbsp. sugar and butter; press firmly onto bottom of pan. Bake 10 minutes. Beat cream cheese, 1 cup sugar, flour and vanilla with electric mixer on medium speed until well blended. Add sour cream; mix well. Add eggs, 1 at a time, mixing on low speed after each addition just until blended. Pour over crust. Bake 1 hour 10 minutes or until center is almost set. Run knife or metal spatula around rim of pan to loosen cake; cool before removing rim of pan. Refrigerate 4 hours or overnight. Top with pie filling before serving. Size-Wise: Sweets can add enjoyment to a balanced diet, but remember to keep an eye on portions. 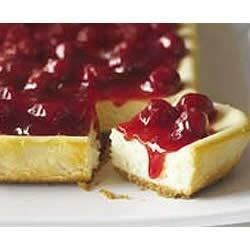 New York Lemon Cheesecake: Prepare as directed, omitting cherry pie filling and adding 2 Tbsp. lemon juice and 1-1/2 tsp. grated lemon peel to the cream cheese batter before pouring over crust. How to Bake in Springform Pan: Preheat oven to 325 degrees F if using 9-inch springform pan (or 300 degrees F if using a dark nonstick 9-inch springform pan). Prepare as directed. Bake 1 hour 10 min. or until center is almost set. Run knife or metal spatula around rim of pan to loosen cake; cool before removing rim of pan. It sadly did not work at all it didn't cook and it fell apart. Very good recipe. I actually make this for my Dad because he is diabetic. I do not use the crust, I use splenda instead of sugar. Very good. I didnt have a springform pan, so i cut the recipe in half, except for the crust and baked it in an 8 by 8 glass pan...turned out awesome!! I have actually been making this recipe for years. It is requested by my family every year for Thanksgiving and it always turns out great!